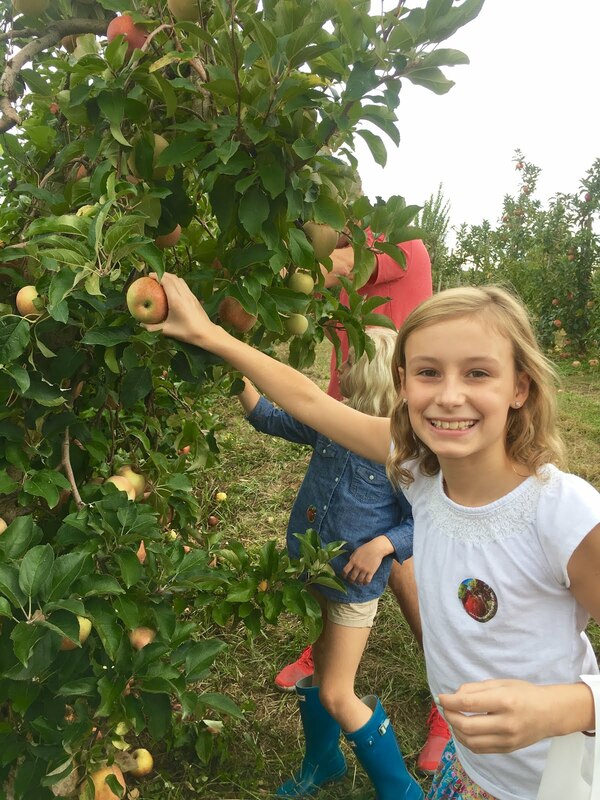 Yesterday I mentioned that we went apple picking over the weekend and ran into Jen's family! They are regulars at Mercier Orchards, but this was our first year at this location. I'm sure she will share about their experience because our time only overlapped for a few minutes, but I will say that we had a wonderful day! It was perfect weather and the perfect fall activity for the day. Now looking at the boys' attire you might think it was pretty cold, but nope. It was a pleasant 77 degrees. They just have minds of their own as we are sure all of you mamas can relate to. You really want to wear a hoodie sweatshirt and a toboggan even though we tell you it's too warm? Well, go ahead then. Mercier Orchards is about 1.5 hours north of Atlanta, but it is an easy drive and worth the time in the car, in my opinion. We were kind of rushed on this day because we had to be back for Little Mama's evening cheer practice, but if we had more time we would have probably made a day of it and either had lunch or dinner up that way, too. We spotted a ton of awesome looking BBQ restaurants! The first order of business after bidding farewell to Jen's family was hopping on the tractor ride and making our way to the orchards. It's $4 a person to visit the orchard and you also select what size bag you want for your apples (which is an additional cost). 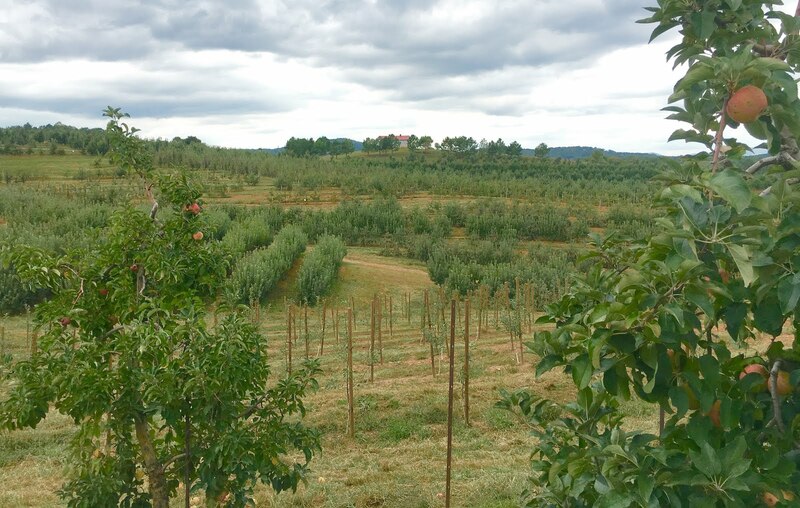 After the very sort ride, complete with a little history about the orchard, we climb off the tractor and are greeted with this gorgeous view! It was cloudy and overcast this day, which made it perfect because we weren't hot. 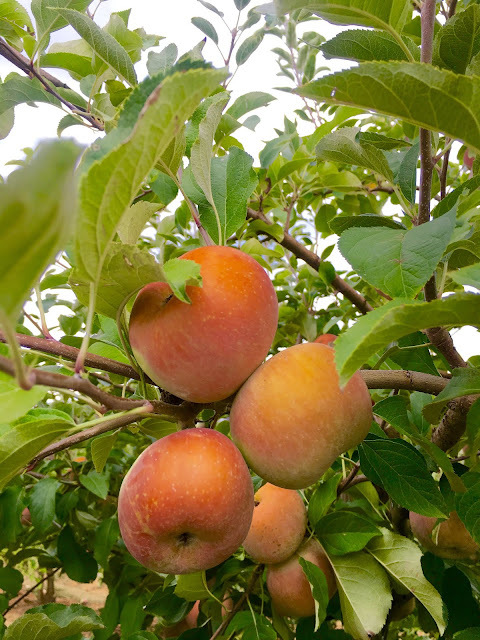 There were apples trees for as far as the eye could see! So many different varieties, too! 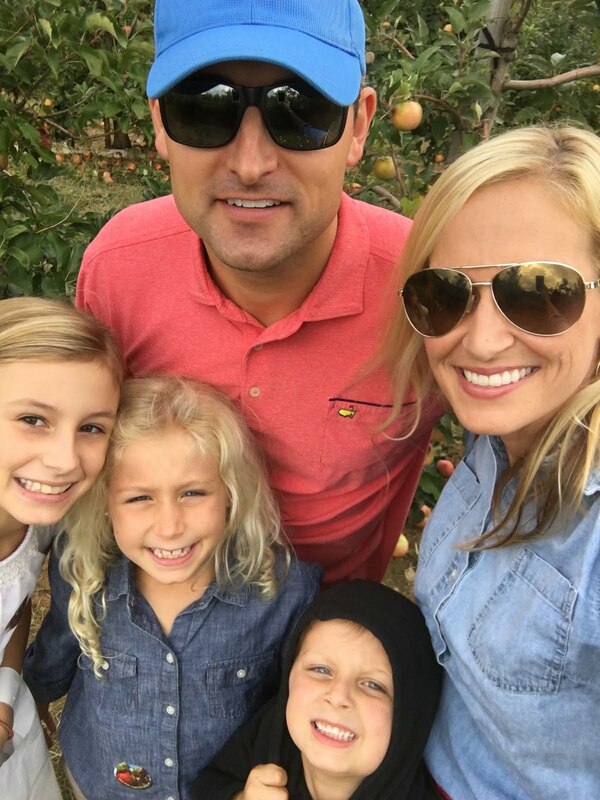 I was just so happy to be out and about on this perfect fall day with my little family! The kids got to picking right away. We got the medium sized bag because honestly I didn't think we would be able to use all of the apples before they went bad, and it was plenty big enough for all of us to pick apples. We tried to visit different rows of trees so we would have a sampling of all the varieties they offer. Buddy is my very picky eater, but he recently discovered that he likes apples and by like I mean he will tell me he wants one so I'll slice it for him and he'll eat 1/2 a slice. Maybe 1 full slice if I'm lucky. 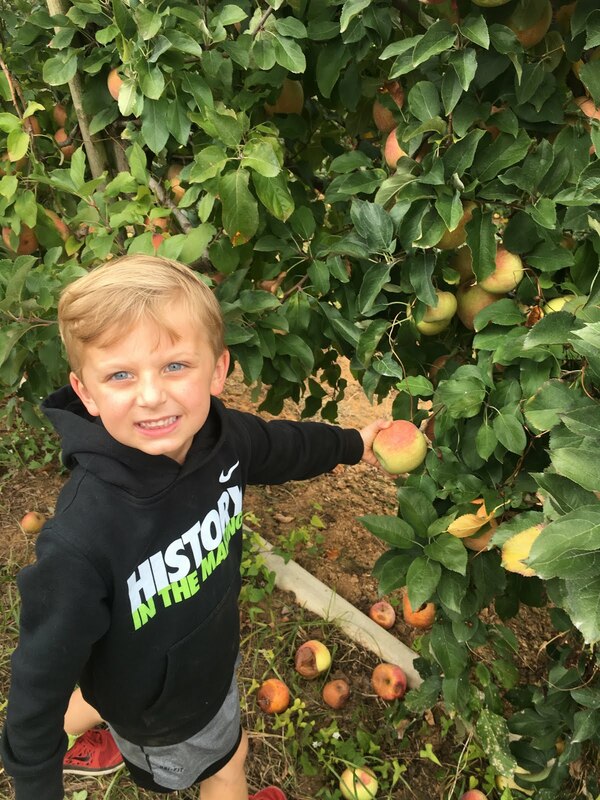 Well friends, he ate more apples while we were picking than ended up in the bag! Seriously, he couldn't get enough. I'm thinking I need to take him to more U-Pick farms to see if that gets him willing to eat more! 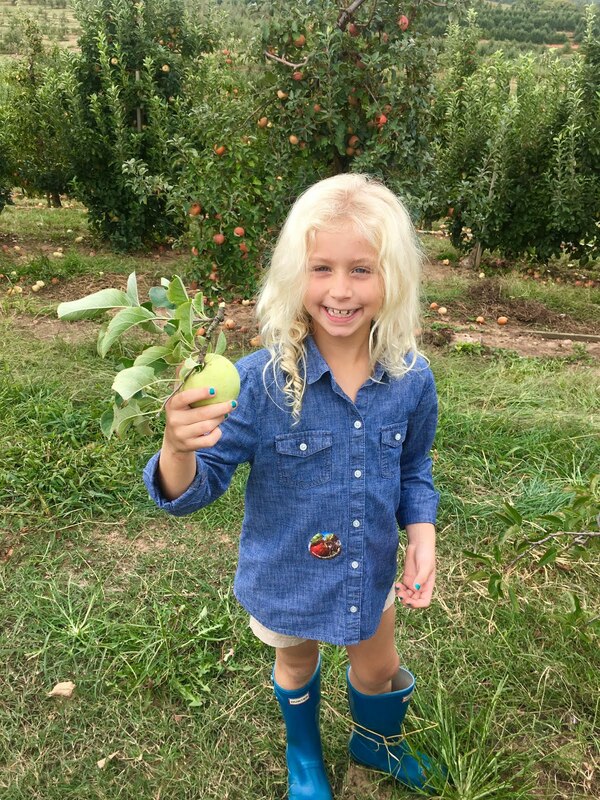 This blonde cutie thought it was so funny that this apple came off the tree with a bunch of leaves, too! 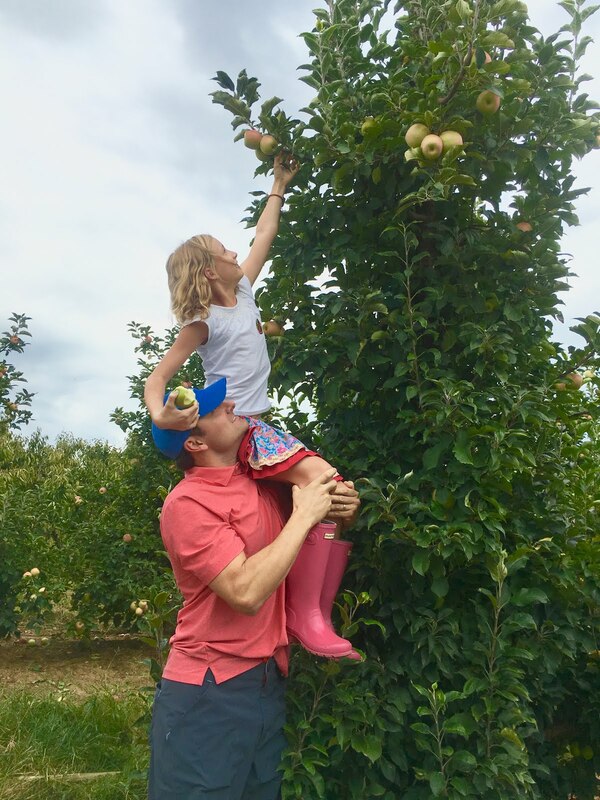 We learned a little tip while we were there...some of the best apples are WAY up high because not many people can reach them. With a little lift from the Mr., Little Mama was determined to get the ones at the top. 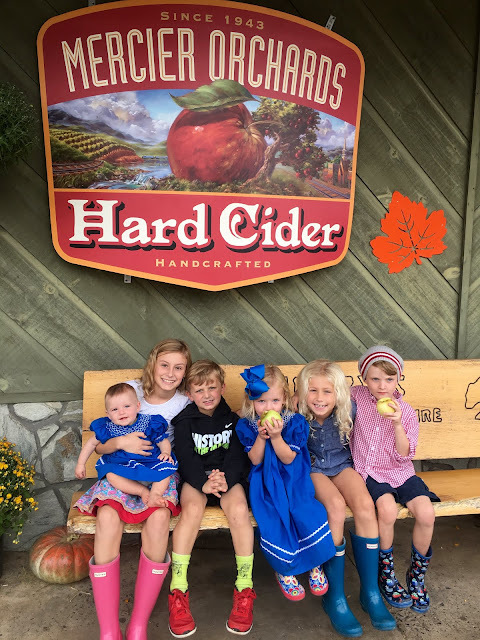 After we filled our bag and had done enough tasting to satisfy our palates we took the tractor ride back to the store and decided to check out all they had to offer. Well if you could imagine it, they had it. 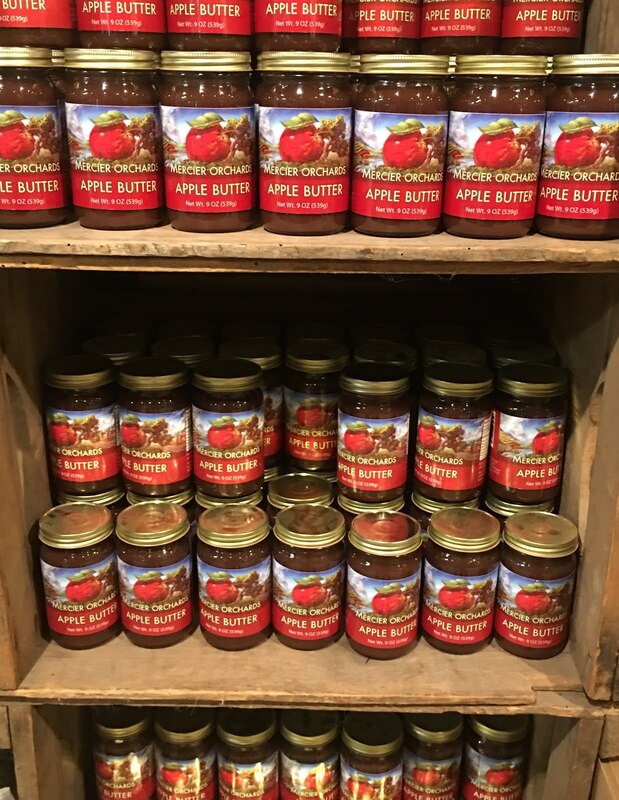 Everything from apple pies and apple turnovers to apple ice cream and apple donuts. We still have a good bit of apple products from Mercier's from a gift basket I received after judging the Miss Apple Capital pageant, so after a quick look around we made a bee line to the very back so I could get what I came for. 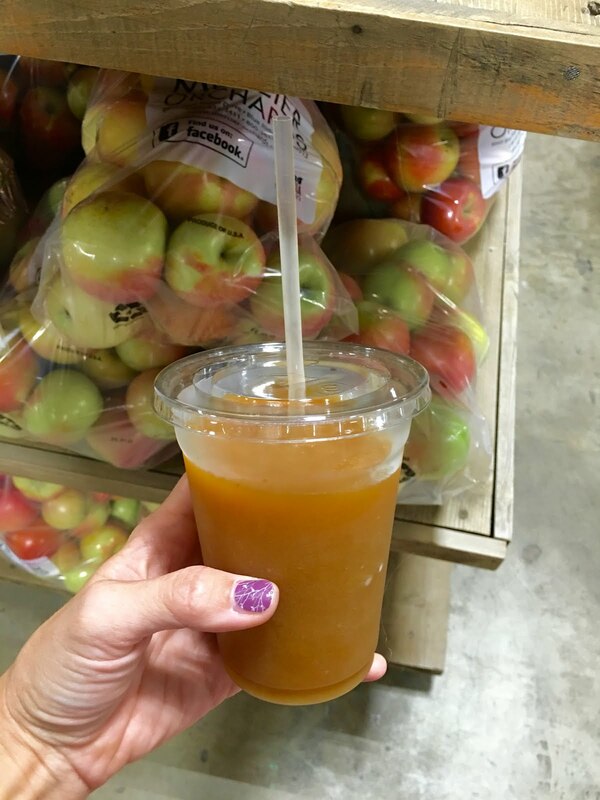 Apple Cider Slushie! Oh my goodness, I was hoping they would have these and was so excited when they did! It is delish and probably my favorite fall treat. They were giving out samples so the kids all tasted and shockingly decided to have this over ice-cream as their treat. It really wasn't a surprise though. They are THAT good. We've been eating on our apples all week and I even whipped up a little dessert using some of them that I will share with y'all tomorrow, so be sure to check back then. Hope everyone has a wonderful Thursday!